Broccoli is a cruciferous vegetable which belongs to the Brassica genus of plants. It's a type of flower and has a thick, central stalk with grayish green leaves and green florets (there are some purple varieties). 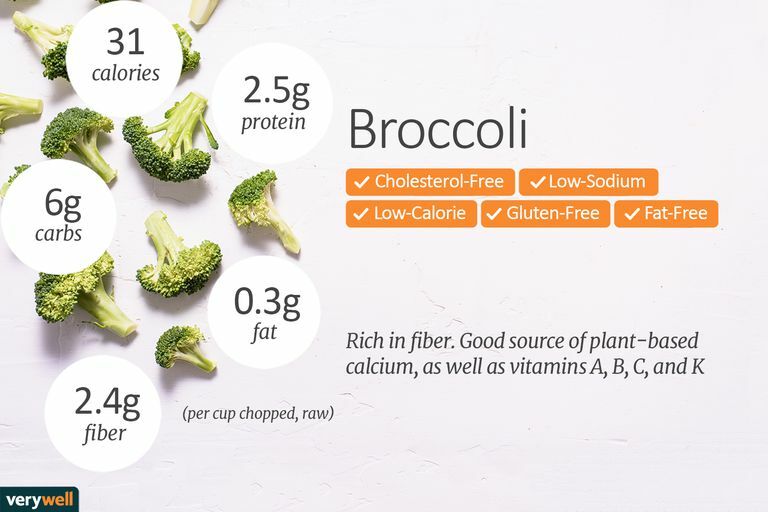 Broccoli is considered to be one of the most nutritious vegetables and, when cooked properly, it can really be a delicious addition to any meal plan. There are many varieties of broccoli, the most well known being the typical broccoli head. Other varieties include broccoli rabe, Chinese broccoli, and Italian heirloom. Fresh broccoli is available year-round with peak season from October through April. One cup of raw, chopped broccoli contains only 31 calories, 6 grams of carbohydrates, 2.6 grams of fiber, and 6 grams net carbs. More than a third of the carbohydrates found in broccoli come from fiber, making it a filling, heart-healthy food choice. The glycemic effect of cabbage is minimal, meaning it doesn't raise your blood sugar. It doesn't have a measured glycemic index as it's a non-starchy vegetable. Broccoli has only a trace amount of fat and is cholesterol-free. It does, however, contain a small amount of omega-3 fats, in the form of alpha-linolenic acid. For a vegetable, broccoli has a significant amount of protein. But you still should include other protein sources in your diet to meet your daily needs. Broccoli is bursting with vitamins and minerals. It's an excellent source of immune-boosting vitamin C (it contains 81 milligrams, which is more than what you need in a day) and vitamin K, an important factor in bone health and wound healing. It's also a very good source of the B vitamin folate, and a good source of vitamin A, manganese, potassium, and other B vitamins. At only 31 calories a cup, broccoli is a popular addition to the plates of those looking to both lose weight. While low in calories, it's high in fiber, with one cup providing about nine percent of the recommended daily value. Fiber, the indigestible part of carbohydrate, can help to reduce cholesterol, promote bowel health, regulate blood sugars, and aid in weight loss. Some studies suggest that eating higher amounts of cruciferous vegetables like broccoli, cabbage, cauliflower, Brussels sprouts, and kale—aim for three to five servings—can reduce the risk of certain types of cancer, including prostate, lung, and breast cancer. Broccoli is also one of the foods with the highest levels of antioxidant phytonutrients on a per-calorie basis. Antioxidants help to fight off free radicals that can cause inflammation and disease. What part of broccoli can I eat? Broccoli heads, or the florets at the top, and the attached stem are the edible parts of the plant. Just be sure to cut off the bottom one to two inches, which can be tough and woody. Why does broccoli smell so bad when cooking? Broccoli contains a group of substances known as glucosinolates, which are sulfur-containing chemicals. These substances give broccoli its pungent smell. Placing a piece of bread into the bottom of the pot when cooking is said to help absorb odors. Why do some people really dislike broccoli? Some people find cruciferous vegetables like broccoli to taste very bitter, possibly because of a gene that may be responsible for the perception of bitter tastes. Broccoli can be eaten raw, as crudite or slaw, or can be prepared using a variety of cooking methods. Steam, s​auté, or roast it to compliment your main meal or use the stems to make soup. Choose fresh broccoli stalks with compact clusters of tightly closed bright or dark green florets, avoiding stalks with yellow flowers. Avoid overcooking, as it will not only make it less visually appealing but will reduce the availability of vitamins and minerals. To avoid brownish colored broccoli, try not to overcook it. Broccoli shouldn't be too mushy. You can maintain a beautiful green hue by blanching your broccoli first—this will not only enhance the color of broccoli but will help to soften the stems. Blanching is a cooking technique in which food is briefly immersed in salted boiling water (about 30 seconds) and then rapidly cooled in ice water. If you want to freeze broccoli, blanch it first and then store it in the freezer in an airtight container. Fresh, unwashed broccoli can be stored in loose or perforated plastic bags in the vegetable crisper of the refrigerator for three to five days. You can also purchase frozen broccoli, which usually stays good for about a year. You can eat broccoli round the clock: Get a veggie dose in the morning by adding broccoli to egg dishes or use as a base or side dish for a low-carb dinner. Broccoli food allergies are very rare, but isolated cases have been reported. There can be a food-pollen syndrome if you have hay fever due to mugwort pollen. Broccoli, cabbage, and related vegetables have proteins similar to those in mugwort pollen and can cause a reaction when you eat them. You may feel a tingling on your lips and tongue. In extremely rare cases, this can progress to a swollen throat or anaphylaxis. Broccoli is high in vitamin K and eating large quantities or making sudden changes in the amount eaten can interfere with the effectiveness and safety of Coumadin (warfarin) and reduce its blood-thinning effect. When you're on blood thinners, discuss with your doctor which foods you should limit or avoid. Labensky, SR, Hause, AM. On Cooking: A Textbook of Culinary Fundamentals. 3rd ed. Upper Saddle River, NJ: Prentice Hall, 2003: 617. Linus Pauling Institute. Micronutrients for Health. National Cancer Institute. Cruciferous Vegetables and Cancer Prevention. Sugita, Yuri. Mugwort-Mustard Allergy Syndrome due to Broccoli Consumption. Case Rep Dermatol Med. 2016; 2016: 8413767.